A lawn or garden that’s free of weeds looks more captivating to the eyes. But keeping it in that shape can be quite a tedious work. However, with the right tool, the maintenance task becomes much easier and fun at the same time. From the different tools available on the market, weed eaters have proven to be one of the most efficient. To ensure you get the most from your work, you’ll need to buy some high quality weed eaters. Currently, there are many different models that differ in efficiency, cutting power and durability. In this article, we review the best weed eaters to make it easier for you to choose. You can also read other product reviews such as 4-cycle gas weed eater, battery-powered weed eater, gas weed eater, pole hedge trimmer, string trimmer head, trimmer line, weeding tool. Opening our list of best weed eaters is Black & Decker LST136W. This is a cordless weed eater designed to convert from a trimmer to edger. The process takes only seconds giving you a versatile tool that can tackle most types of weed. Black & Decker LST136W derives power from a 40-Volt lithium ion battery. This battery provides an increased capacity of up to 33%. On a single charge, the battery provides a run time of up to one hour depending on the power setting. It takes only one hour for the battery to attain full charge. This weed eater is equipped with a PowerDrive transmission system that ensures more power is delivered from the motor to the cutting string. A power dial is included to let you adjust the cutting speed to two different settings: 8,500 RPM and 6,500 RPM. 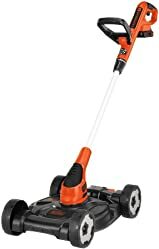 Black & Decker LST136W provides a cutting path of 13 inches, which means you get to clear a large area in a few passes. There’s a rotating head that can be adjusted to a maximum of 180 degrees to provide quick switches between cutting and edging tasks. The presence of an automatic feed spool means continuous working that’s free from bumping. At 7.8 pounds, this weed eater is lightweight enough to minimize user fatigue. It comes with an auxiliary handle designed to provide comfortable multi position grip. Black & Decker LST136W weed eater comes with a 3-year limited warranty. Black & Decker LST136W provides more power in a cordless weed eater. It comes lightweight and provides the convenience of continuous working. It makes a great choice for homeowners in search of a powerful and portable weed eater that has the muscle to slash tough weeds and undergrowth. EGO ST1501S is designed to take the power of a cordless weed eater to the next level. Its powerful and first ever 56-Volt lithium ion battery provides brute power that gets the job done more efficiently. Depending on the use, the battery can last from 10 to 20 minutes. The charging time is fast, taking only 40 minutes to achieve full charge. At 16 pounds, this trimmer is quite on the heavy side. To compensate for that, this weed eater has been designed to provide the most in ergonomic comfort. This functions to minimize fatigue, but only to a small extend. The housing material used on this weed eater is weather resistant, which makes it safe for use in any given environment. The battery powers a high-efficiency brushless motor designed for extreme performance and durability. This motor sports a variable speed that can be set to a maximum of 5,800 RPM. It engages a dual-feed line that’s got a 0.095-inch diameter and delivers a cutting path of 15 inches. Extended reach is achieved via a lightweight aluminum shaft. This telescopic shaft adjusts to a maximum of 49 inches. With it, you get to customize the length based on your height and also get the convenience of accessing hard-to-reach places. This weed eater comes with a 5-year tool warranty and a 3-year battery warranty. This weed eater delivers more cutting power though the run time is quite less. It’s quite of the heavy side. That said, it makes a good choice for homeowners who want a powerful and portable weed eater for small lawns. Black & Decker MTC220 is a weed eater that takes cordless portability to a whole new level. This weed eater comes fitted with 4 wheels to provide smooth movement and increased mobility in most surfaces. Mobility is made even more effortless with a lightweight construction of 9.9 pounds. The 3-in-1 design provides three different landscaping functionality: trimming, edging and mowing. A two 20-Volt battery pack comes in handy to provide extended run time. The batteries charge fully in 4 hours and deliver enough power that fits the versatile functionality. An adjustable deck is included for extra protection from flying objects. This deck can be set to a height of 1.6 to 2.4 inches to accommodate both short and tall weeds. You can choose to remove the deck when switching to other functions. With this weed eater, you get a cutting path of 12 inches and an automatic feed spool that allows for continuous operation. In a single charge, this weed eater can be used on yards measuring up to 1,200 square feet. A pivoting handle is included for comfortable multi position grip. This weed eater comes with a 2-year limited warranty. The wheels fitted in this weed eater provide increased mobility. This tool provides multiple landscaping functionality. Combined with convenient adjustments, it makes a good choice for homeowners who have small yards sporting hard-to-reach areas. This is yet another 3-in-1 weed eater. Worx WG175 comes in a cordless design powered by a 32-Volt lithium ion battery. This battery fully charges within 3 hours and provides a run time of up to 35 minutes of low speed setting. As said earlier, this tool comes in a 3-in-1 design. With it, you get the landscaping functionality of a trimmer, edger and a mini-mower. Switching among the named functions takes only seconds. This weed eater takes lightweight construction and portability to the next level. It weighs a mere 6 pounds for minimum user fatigue and extended use. Fitted on the base are small wheels that come in handy when operating as a mower or edger. The wheels provide smooth movement are are designed to be virtually maintenance-free. Worx WG175 provides a cutting path of 12 inches and has an automatic feed spool designed for continuous operation. There’s a telescopic height adjustment achieved via a quick-release lever. With it, you get an ideal cutting height that matches the size of weed you’re dealing with. A 90-degree tilting head comes in handy when switching to edging and trimming functions. Worx WG175 comes with a 3-year limited warranty. This weed eater sports three different functions and provides the benefit of lightweight handling and easy mobility. This makes it a great choice for homeowners who need a versatile landscaping tool that takes portable design to the limit. Black & Decker gives an economical combo kit. The kit includes a trimmer and a sweeper. Black & Decker LCC140 trimmer comes in a cordless design powered by a 40-Volt lithium ion battery. This battery is included on both tools and provides extended run time to get the job done more efficiently. The powerdrive transmission system gives the trimmer the muscle to take on tough weeds and overgrowth. Cutting operation is continuous and bump-free, thanks to the automatic feed spool. The trimmer converts to an edger in seconds and provides a cutting path of 13 inches. Both tools come lightweight with the trimmer weighing at 8 pounds and the sweeper at 4.7 pounds. What you get is a lightweight combo kit that can be handled with ease. Blowing air at 120 MPH, the sweeper comes in handy to make your home free of debris. The trimmer and sweeper operate at a low noise level that is within the comfort zone. The kit comes with a 3-year limited warranty. This is a combo kit that gives the benefits of both a trimmer/edger and a sweeper. It makes a great purchase for homeowners who want to clean after the trimmed leaves and weeds. GreenWorks makes it on the list with a corded weed eater. GreenWorks 21212 is a string trimmer that comes lightweight. This trimmer weighs at just 5.2 pounds to provides extended use and minimum user fatigue. The 2-in-1 design lets it convert to an edger in a matter of seconds. This weed eater is engaged by a powerful 4-Amp motor that comes to life with the push of a trigger switch. A dual-line feed makes the trims and cuts faster with each revolution. You get a cutting path of 13 inches and you can customize the trimmer to your height via the telescopic shaft. An automatic feed means no bumping. With it, you get a continuous operation that eliminates downtime. The 180-degree rotating handle lets you trim at different angles with ease. This weed eater comes with a 4-year limited warranty. This weed eater comes in a corded design and it’s lightweight enough for minimum user fatigue. It can be adjusted to your comfort level and provides faster cuts. This makes it a great choice for homeowners in need of a fast and efficient weed eater for use on small yards not far from the home. Closing our list is DeWalt DCST920P1 string trimmer. This trimmer comes cordless and equipped with a 20-Volt lithium ion battery. The battery packs enough power to provide extended run time and comes quite light for reduced user fatigue. This trimmer is in the lightweight category, weighing at 8.5 pounds. That said, you get easy handling and maneuvering, especially when performing overheard trimming jobs. The battery delivers power to a brushless motor designed for high efficiency, maximized run time and extended life. The motor speed is variable and can be set at 0 - 4,600 RPM or 0 - 6,000 RPM. A gear drive mechanism ensures that the most power is delivered to tackle tough weeds and overgrowth. This trimmer has a line diameter of 0.08 inch and delivers a cutting path of 13 inches. DeWalt DCST920P1 comes with a 3-year limited warranty. This trimmer delivers plenty of run time and comes at a portable size and weight. With it, you get the convenience of adjustable speed and a powerful motor that lasts for longer. It is a good purchase for homeowners in need of a powerful trimmer for small to medium yards. Understanding the types of weed eaters is quite crucial in your selection process. They come in three different types: corded electric weed eater, cordless electric weed eater and gas-powered weed eater. Let’s take a look at each of them and the advantages and disadvantages you get from using them. Corded or plugin electric weed eaters are those that need plugging into the mains. Generally, corded weed eaters cost and weigh less compared to gas or cordless weed eaters. Most often, you’ll find them weighing less than 10 pounds, a feature that makes them much easier to handle. Apart from the lightweight construction, corded weed eaters tend to be quieter compared to gas types. They don’t need tune-up and start effortless with the push of a button. These tools provide a limited range that needs you to be close to the power outlet. They’re perfect for use on smaller yards and modest landscaping jobs. As the name implies, these weed eaters come cordless. Instead, they’re powered by batteries to provide unrestricted mobility. Like the corded weed eaters, they start easy with the push of a button. Cordless weed eaters are most ideal in short to average size grass. They tend to be heavier compared to corded weed eaters due to the addition of batteries. The size and power of batteries vary. Most often, batteries come in the size of 18 Volts to 40 Volts. However, some manufacturers are going larger by sporting battery sizes of up to 56 Volts. Unlike corded electric weed eaters, you get a limited run time averaging about 30 minutes. That means you need to recharge after power is depleted. The recharge time ranges from as little as 40 minutes to several hours depending on the model. Cordless weed eaters tend to be expensive compared to corded and gas-powered weed eaters. Among the three types, gas-powered weed eaters pack the most power. That’s why they’re best for large areas that have tall grass and weeds. Gas-powered weed eaters are generally the heaviest. However, you can get those that weight less than 13 pounds. These weed eaters need you to mix oil and gas, something that creates a lot of mess in your work. But some manufacturers have improved on their models to feature less mess and reduced exhaust emission. Gas-powered string weed eaters need some effort to start. This is mainly achieved via a pull start mechanism. These weed eaters come more expensive than corded electric weed eaters. This is the first consideration that you need to take into account. Generally, corded weed eaters are ideal for lighter duty landscaping tasks. This makes them a perfect choice for tackling medium sized weeds and grasses. And remember, the area of work should be close to the electrical outlet. Gas-powered weed eaters are typically more powerful. They’re more effective at tackling tall grass and weeds. Cordless weed eaters have almost the same power as gas-powered weed eaters. These come in handy for jobs that require lots of movement. You might also want to consider the topography of your yard. Uneven ground requires the use of a wheeled weed eater. This is to provide easy mobility and access hard-to-reach areas. In choosing the right weight for a weed eater, you generally want to first consider the time that you will be using the tool. Weight doesn’t matter a lot in jobs that require only a few minutes. However, if you’re going use the weed eater for a longer time, then you might want to choose a lightweight model for the task. You need a trusted brand that’s known for its quality products. In the world of weed eaters, the top brands to consider include Black & Decker, DeWalt, GreenWorks, Worx, among others. It’s not advisable to purchase a weed eater that lacks a warranty. A warranty of 1 to 2 years is more common. However, brands such as GreenWorks have gone an extra mile to provide longer warranties of up to 4 years.